Based upon my recent album, "Donovan Songs" - a whole CD of songs written by Donovan. "Donovan Songs" features 13 songs written by Donovan - everything from a couple of the big hits he had in the 60s such as Mellow Yellow and Catch the Wind to lesser known songs such as The Ferryman Daughter, Sand and Foam, Voyage to the Moon and plenty of others from his various albums. 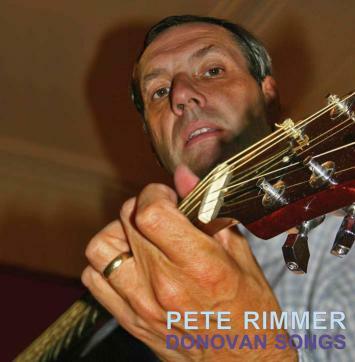 The songs are played in a gentle Donovan style on guitars, bass, fiddle, viola, whistles, mandolins and recorders. Pete has a quite a few recordings available and performs on CDs with Bill Hackney, Gallimaufry, and the Jill Fielding Band and others. Along with Sarah Marks and Roger Gardiner, Gallimaufry is a trio who perform all over the North West, and their album is "Kid on the Mountain". Pete's first solo album is called "Fill My Pockets - With Rain"
Pete has been a performer since 1967 in those heady days of the folk boom. Over these years he has been involved in most of the folk events in the North West of England such concerts at the Southport Arts Centre, Southport Theatre and Floral Hall. Pete is a long time resident singer at the world famous Bothy Folk Club in Southport and a regular performer at a number of folk clubs and festivals such the Fylde Folk Festival each September. He has also played with various barn dance bands, duos with Bev Sanders and Bill Hackney, backing guitarist with anyone who will put up with him.